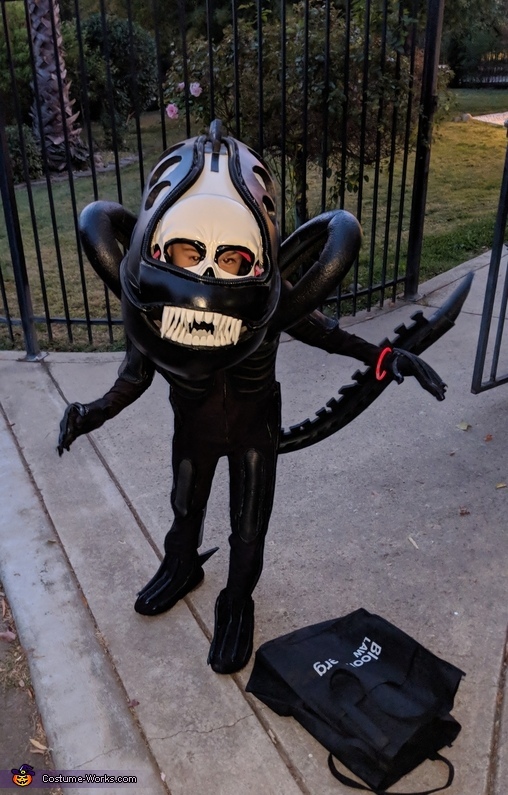 My 9 year old son Phin chose to be a Xenomorph for Halloween. The alien Xenomorph is from the Alien movie franchise. This costume was inspired by the original full-grown alien from the first movie aka the "big chap." I made the vast majority of the costume from scratch. The main headpiece is made of EVA foam, plastic, and cardboard mounted on a bike helmet. The skull part is a store bought plastic mask. The embellishment around the sides is plastic flex tubing from the hardware store. The double set of teeth are handmade out of polymer clay which was baked to harden then lacquered with a clear coat. The ribcage portion is made of EVA foam. The shoulders, back detail, and tail are made out of pool noodles and flex tubing. The bodysuit was entirely homemade and embellished with plastic flex tubing and flexible mesh tubing. The feet are homemade fabric covers on top of an existing pair of boots embellished with plastic flex tubing and acrylic fingernails for the claws. The hands are store bought gloves which were home tailored to fit my son's small hands and again embellished with plastic flex tubing and acrylic nails. On Halloween night, I added red glowsticks to the eyes and the sides of the head. In all I spent around $100 on materials. I worked on it on and off for 2 months.